MOST STONE ISN’T TRANSLUCENT. HOWEVER, SOME ONYX, MARBLE, QUARTZITE, AND OTHER STONE PRODUCTS ARE. THEY SHARE ALL THE SAME ORGANIC BEAUTY AND BENEFITS OF A STANDARD GRANITE SLAB. EXCEPT THEY HAVE THE MAGICAL ABILITY TO TRANSMIT LIGHT. WITH A CUSTOM IMAGILUX LED LIGHT PANEL UNDERNEATH THEY BACKLIGHT BEAUTIFULLY. The very best custom homes commonly share one particular characteristic. The trouble is, it’s an intangible one. Not always immediately apparent, still it’s unmistakable, like a familiar perfume catching your attention in a crowded room and instantly transporting you to a different place and time. For a moment, you unconsciously catch your breath and transcend the present. This “je ne sais quoi” factor—as a form of beauty—lies within the eyes of the beholder. It’s personal. You know it when you experience it—it just feels “right.” Architecture and design may evoke this response, as surely as a melody or a fragrance can. This desirable aspect of architecture comes from our perception of the space and character of a built environment. There is no formula to produce the emotional effect. Its provenance could be within an architectural theme, the use of unique material combinations, or a harmonious integration within a landscape. Other times, it stems from a design taking advantage of a stunning vista or another single exceptional feature. STONE MAKES A PERFECT EXAMPLE. 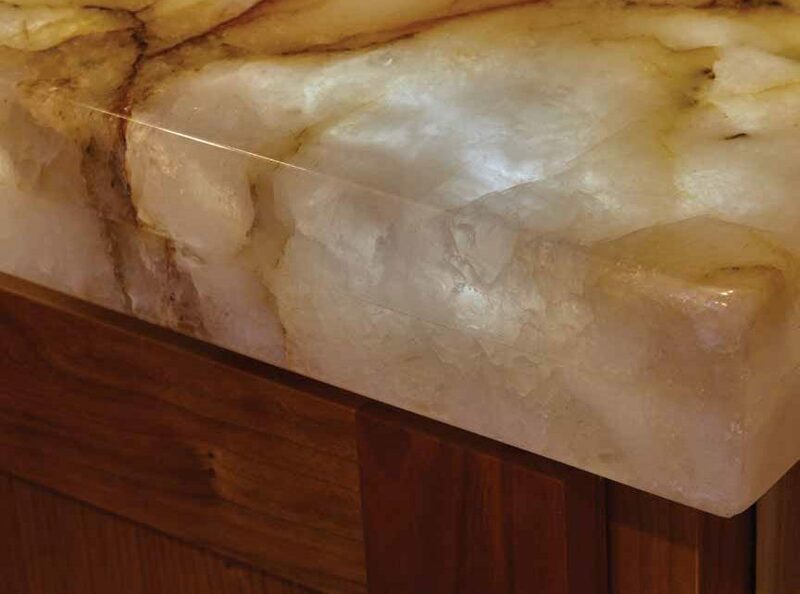 IT’S IS A WONDERFUL MATERIAL FOR FIREPLACE SURROUNDS, BATHROOM AND KITCHEN COUNTERTOPS, KITCHEN ISLANDS, BARS, AND WINE CELLARS. IT’S BEAUTIFUL, DURABLE, AND EASY TO CLEAN AND MAINTAIN. TIMES MAY CHANGE BUT STONE ISN’T GOING ANYWHERE—LEAST OF ALL OUT OF STYLE. Whether it’s the result of a trickling down of decisions from architect to contractor to interior designer—or simply judicious placement of a striking design component—in the end, the goal is for the whole to truly become greater than the sum of the parts. Single rooms can command this attention within a space. Opportunities to design for this effect abound: expansive entries, mountain living room vistas, and welcoming kitchens can all anchor a design firmly within range of the transcendent. ImagiLux, a Eugene, Oregon-based company, manufactures a unique product that may hold the key to elevating your interior design project to that unmistakable and memorable level. 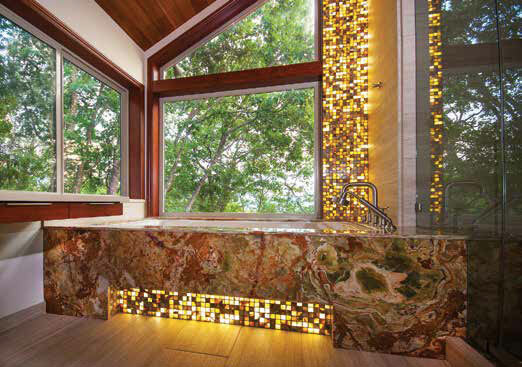 Custom LED panels allow light to be used in entirely new ways. Ultra-thin and available in any shape or size, these brilliant light “sheets” make it simple to showcase design elements in such a way that the whole does, in fact, become greater than the sum of the parts. SHINE A LIGHT UNDER IT AND LIGHT IT UP. The only problem? Most stone isn’t translucent. 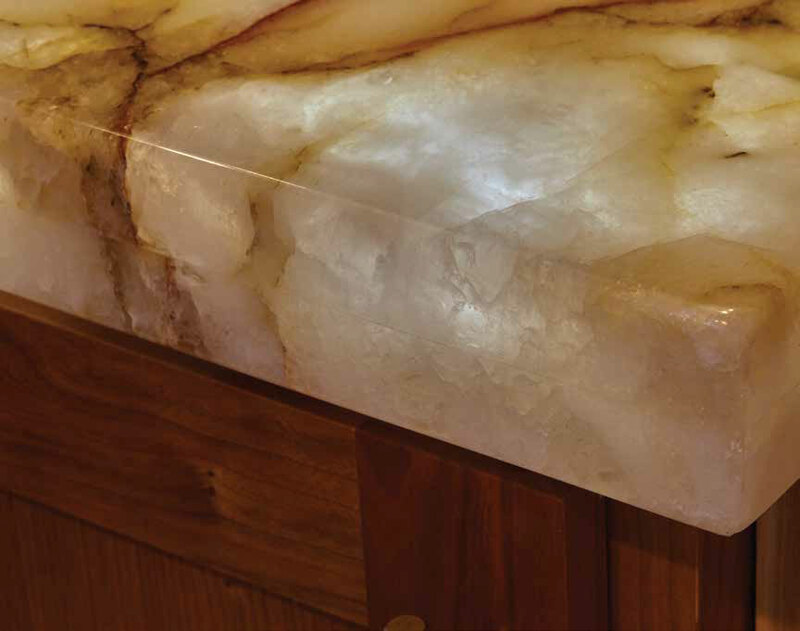 But some onyx, marble, quartzite, and other stone products are. 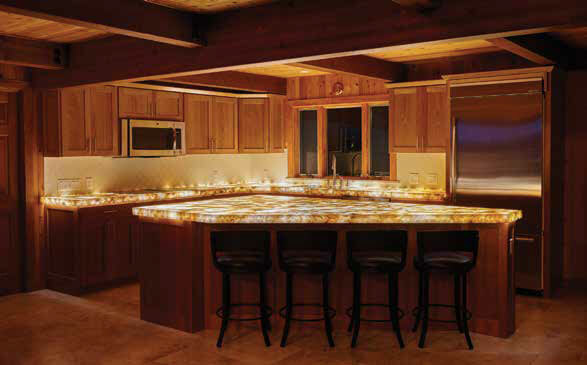 They share the same organic beauty and benefits of a standard granite slab. Except they have the magical ability to transmit light. And, with a custom LED light panel underneath, they backlight beautifully. The difference is stunning. There’s nothing else like it. 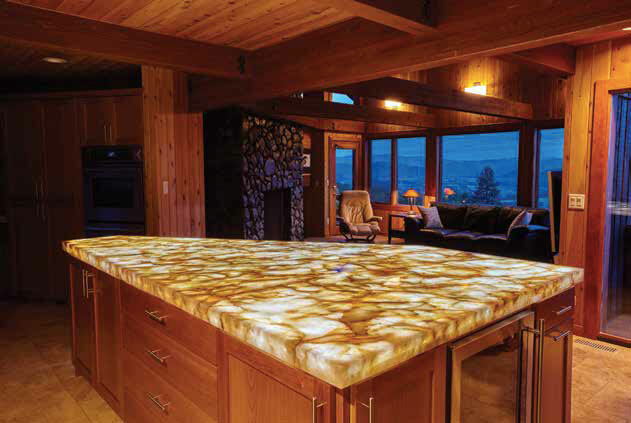 A beautiful stone kitchen island suddenly becomes a mesmerizing focal point as the sun slips below the horizon. Translucent stone pairs perfectly with LED light panels, a new tool that architects, designers, and contractors are just now beginning to discover. And there wasn’t anything else similar. 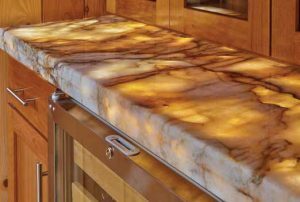 But the stone supplier suggested a beautiful cream quartzite slab, veined with darker ranges of rust and brown and speckled with crystal inclusions. “Our cabinet maker had heard of backlighting onyx, and thought this quartzite would work perfectly; we were intrigued. We had never heard of the technique and never would have thought of it,” says the homeowner. “We almost went with a system of multiple small 12”x12” light tiles, but the wiring would have been a nightmare. The contractor recommended ImagiLux with custom-sized large panels in Eugene. He called us and said he’d found the right product and people to get the job done right. So we told him to go for it. But we didn’t really know what we were getting,” he chuckles. It’s possible to transform the ordinary into the extraordinary. ImagiLux custom LED light panels put a fresh, new twist on the challenge of creating a visual design statement. The intangible may be within reach. FOR MORE INFORMATION CALL IMAGILUX AT 541.228.3650 OR VISIT IMAGILUXLED.COM.